***BEAUTIFUL CHARACTER COTTAGE.. NEW PRICE.. .. A MUST SEE PROPERTY, CONTACT THE OFFICE TODAY TO ARRANGE A VIEWING..Set within mature expansive gardens with outdoor seating areas to enjoy to the maximum ........A fabulous detached character cottage updated and remodeled by the current owners, occupying a unique position within the highly sought after area of Mossley. 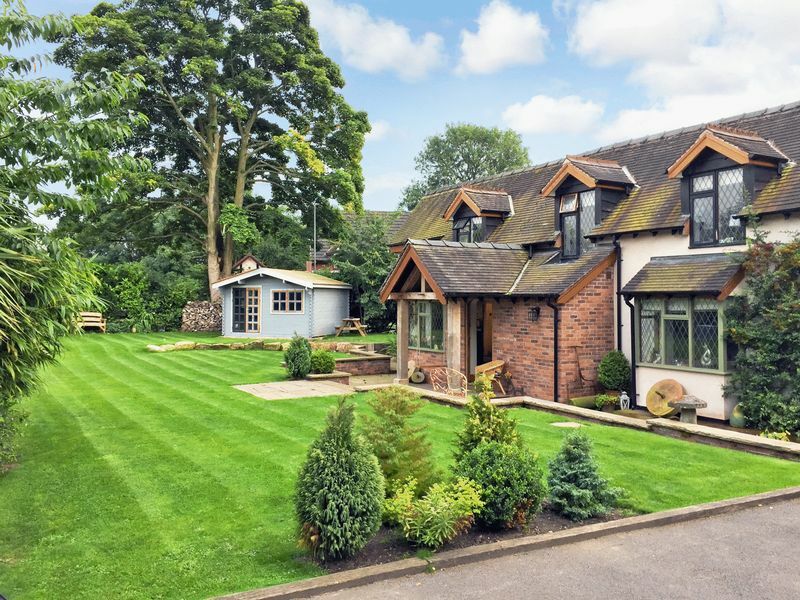 Nestled off Leek Road with its own private driveway access the property enjoys a large plot with lovingly manicured gardens and grounds. This is a must see home with all the features, flexibility, and the character that it has to offer. 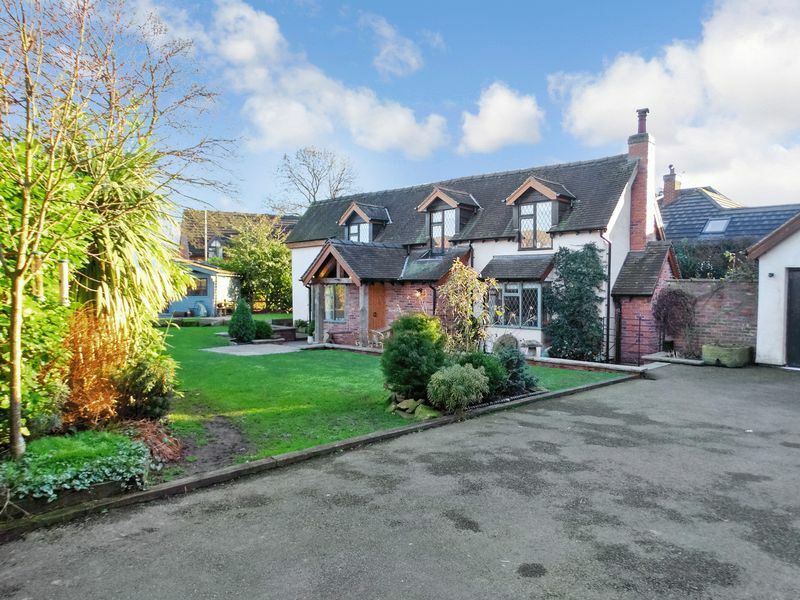 Accessed from its private driveway by wooden gates to the main drive which provides ample parking for several vehicles and leads to the detached double garage. 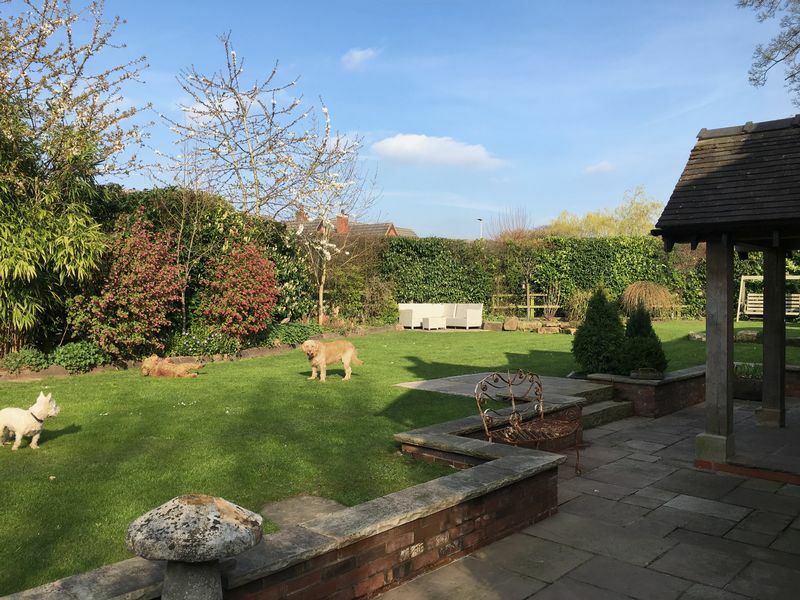 Stone paved walkways surround the cottage with large paved patio outdoor seating areas and large lawned gardens with an array of mature well-stocked and maintained borders. 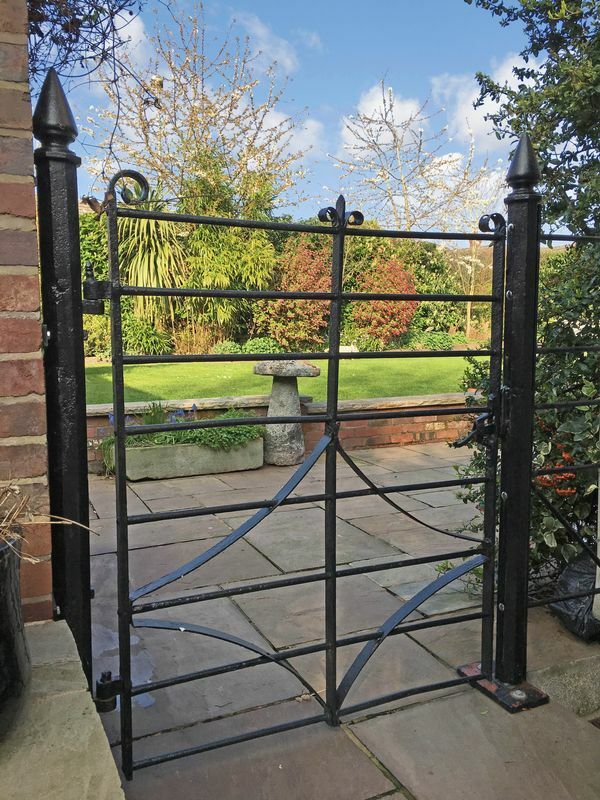 A further addition is the summer house or office, this is a wonderfully relaxing feature of the garden, offering that flexibility for many purposes. 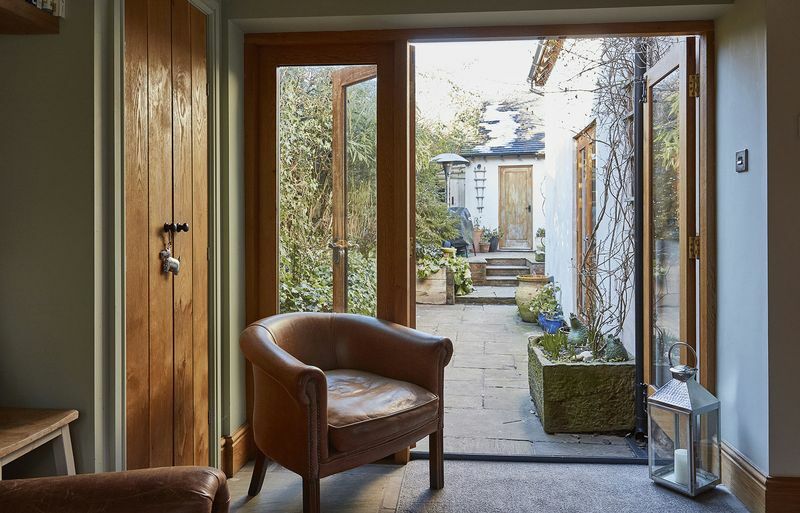 The property itself has a lovely welcoming feel with the open solid wood porch and seating area giving access to the entrance hall via the solid wood front door. 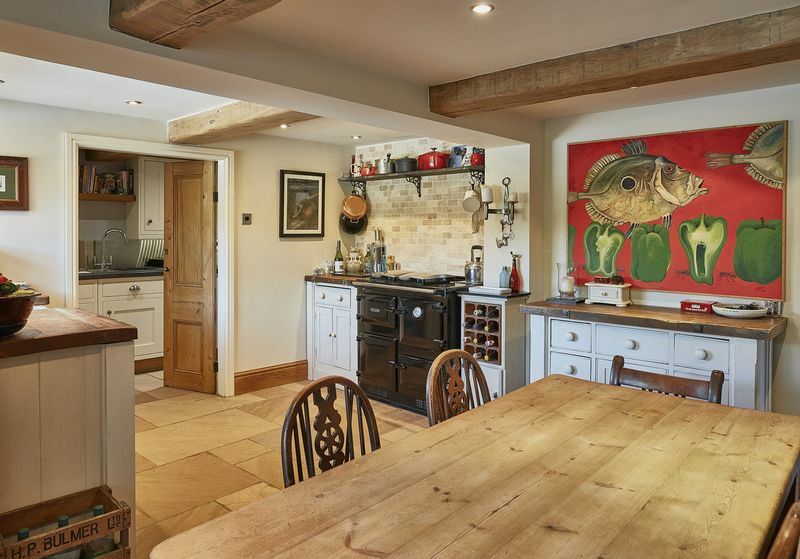 This opens to the generous dining kitchen which offers many features including exposed solid oak beams, stone flooring and indeed the Rayburn Range Oven. 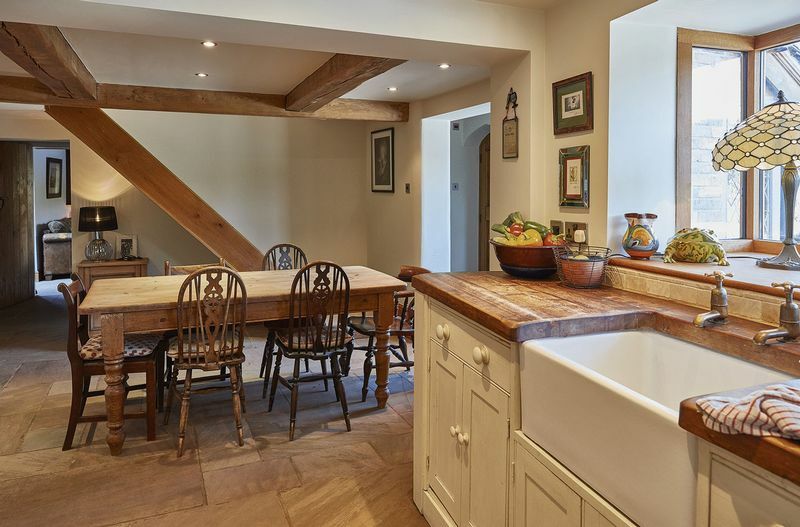 The kitchen gives access to the snug and a handy utility room. 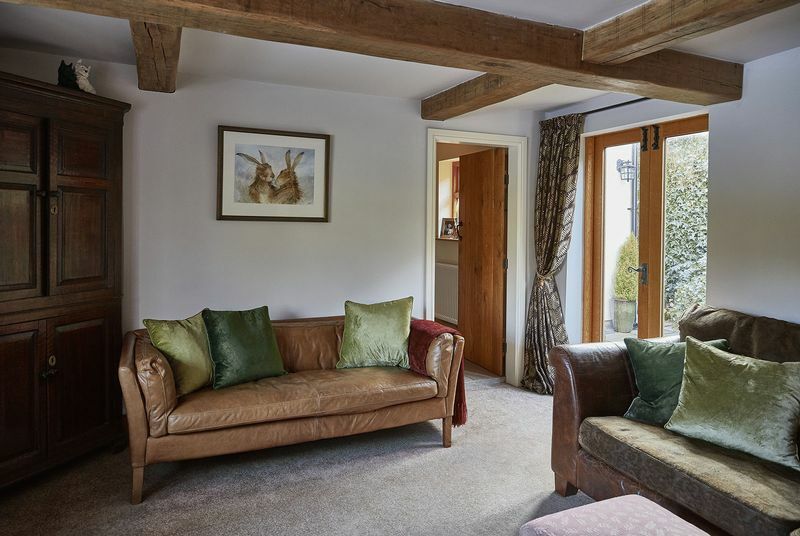 An inner hall walks through to the office and the spacious living room which features a multi fuel stove and further exposed solid oak beams . 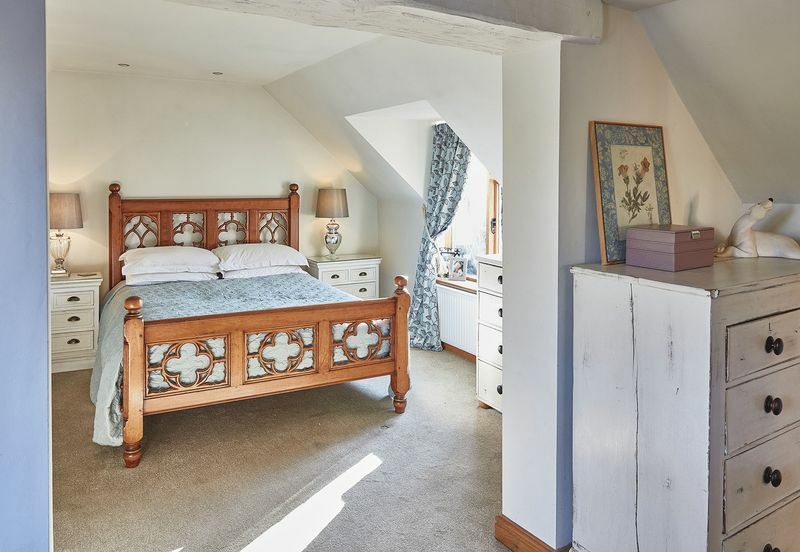 A split level landing to the first floor with wooden latch doors giving access to the generous master bedroom which has its own large dressing room. 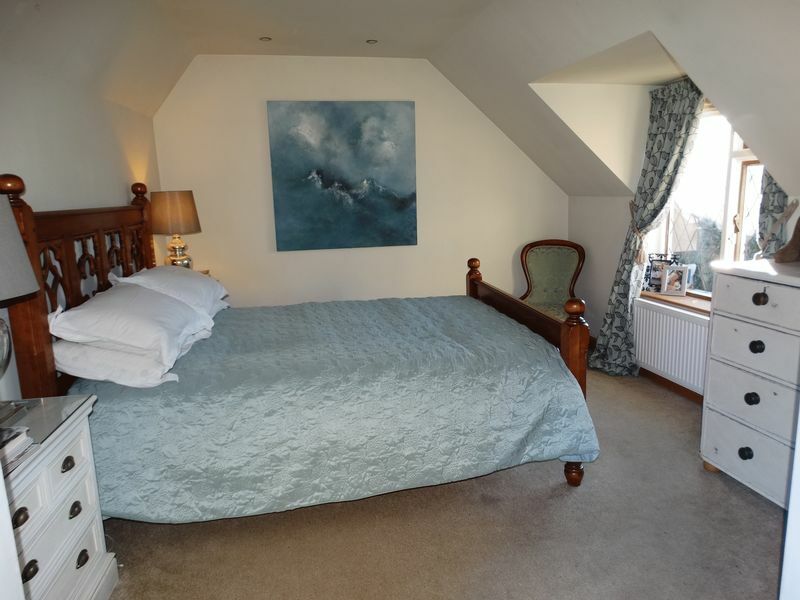 With two further double bedrooms and a bespoke four piece family bathroom. 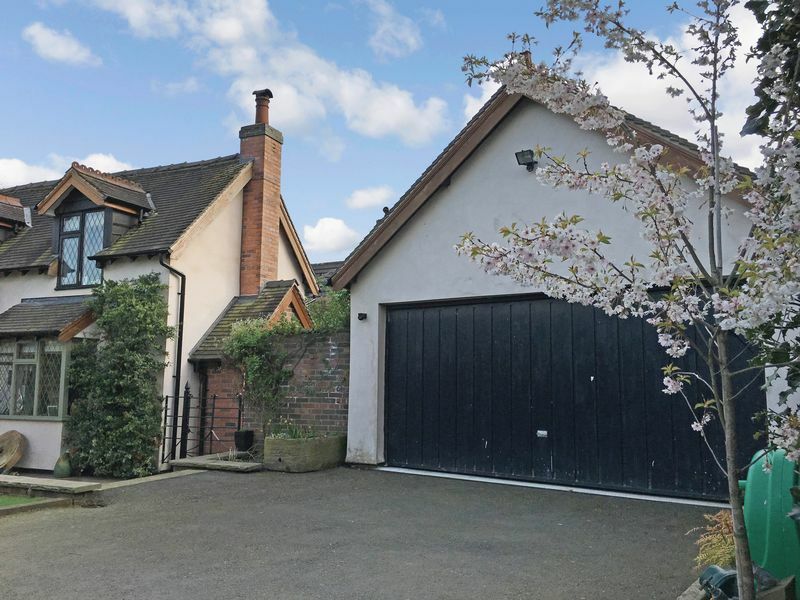 Outside, the detached double garage provides ample parking or storage space, with the addition of a loft/play room, ideal for families and other purposes. 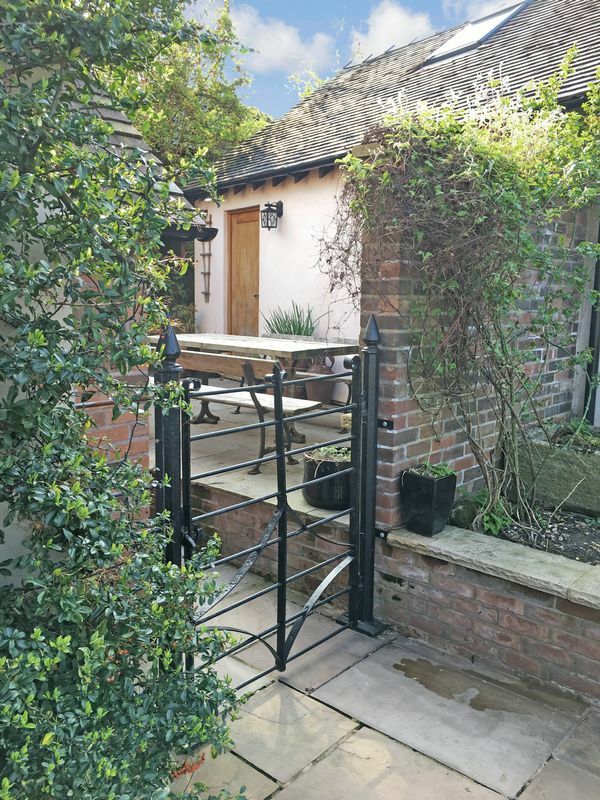 The garage has a handy garden/potting shed attached, also a raised 'Hideaway' patio seating area which is ideal for outdoor dining. 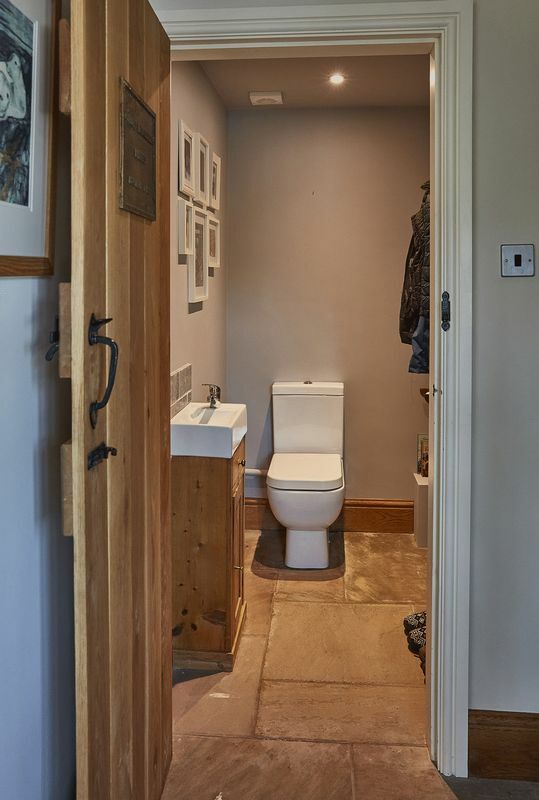 Fitted with a modern contemporary two piece suite comprising; wash hand basin with splashback tiling and incorporating a storage cupboard and a low level W.c., radiator, stone flooring and inset spot light extractor fan. Fitted with a bespoke range of base level units with solid wood work top surfaces incorporating a Belfast style sink with drainer. 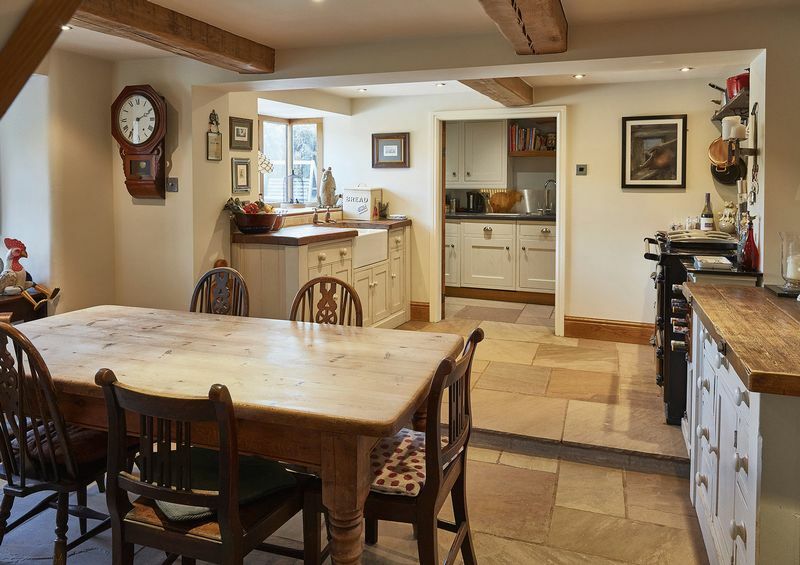 A feature Rayburn range with double ovens and warming plates which also serves the central heating system. With an integrated fridge, feature solid oak beamed ceilings with inset spot lights, stairway to the first floor, solid stone flooring, front aspect double glazed bay window, part tiled walls, wooden French doors giving access to the utility room, and open plan to the Snug with wooden French doors giving access to the rear garden. Fitted with a bespoke range of wall mounted and base level units with complimentary rolled work top surface incorporating a one and half bowl sink and drainer, integrated freezer, integrated dishwasher, solid oak beamed ceilings, inset spot lights, solid oak stable style door giving access to the rear, radiator, and stone flooring. 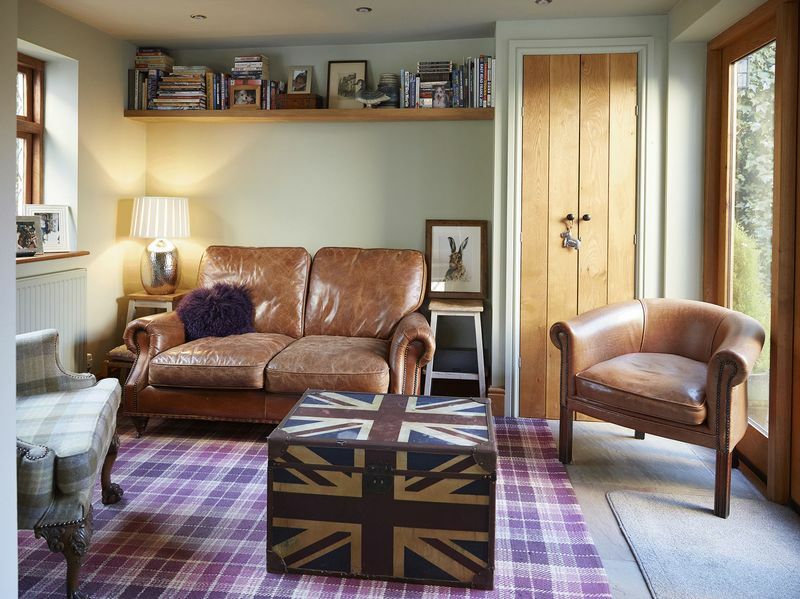 With solid oak wood double glazed windows, French doors giving access to the rear, radiator, stone flooring, inset spot lighting, and a handy built-in storage cupboard. 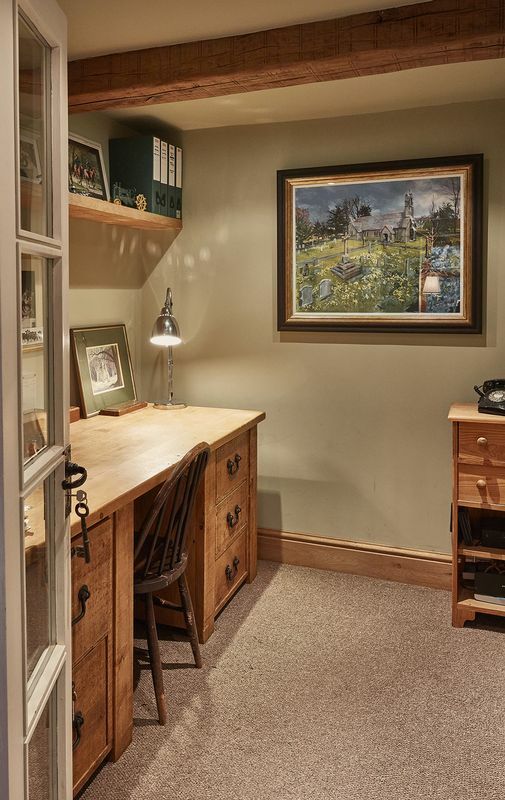 With a solid oak wood double glazed window, radiator, solid oak beamed ceiling, stone flooring, French doors giving access to the office. 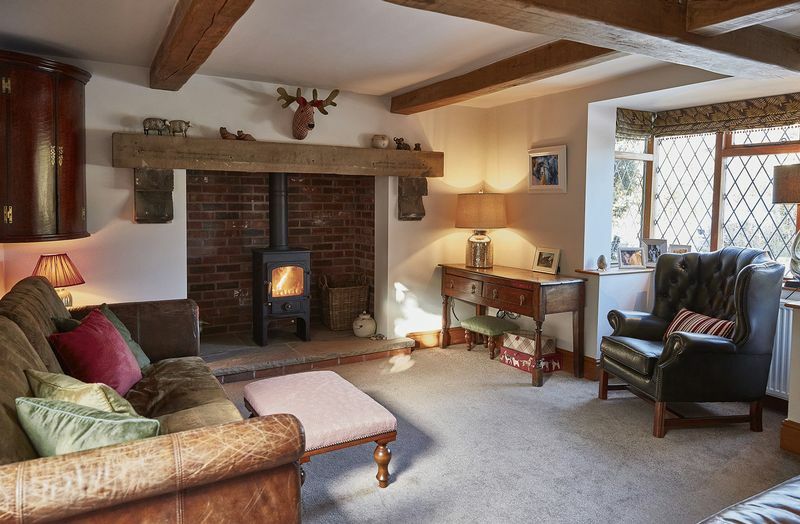 With a radiator, inset spot lights, solid oak beamed ceiling, power points. With a front aspect solid oak wood double glazed leaded bay window and double glazed French doors giving access to the rear. A feature inset fireplace housing a Clearview Multi fuel stove with a stone hearth and exposed brick walling. 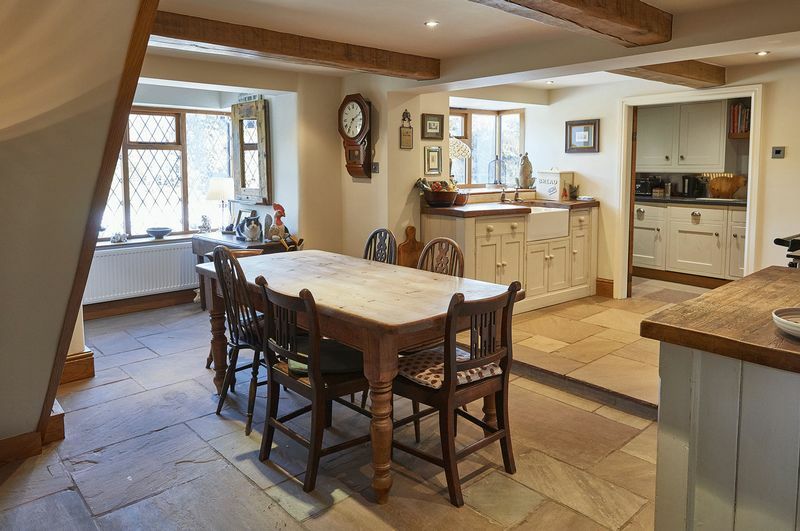 Feature solid oak beamed ceilings, radiator, power points. 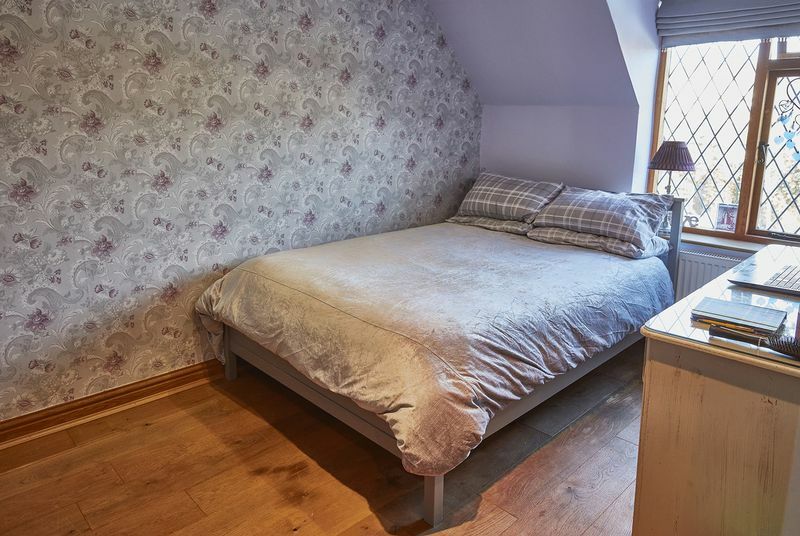 A generous and flexible room with a front aspect double glazed leaded window, radiator, built-in storage cupboard, power points. 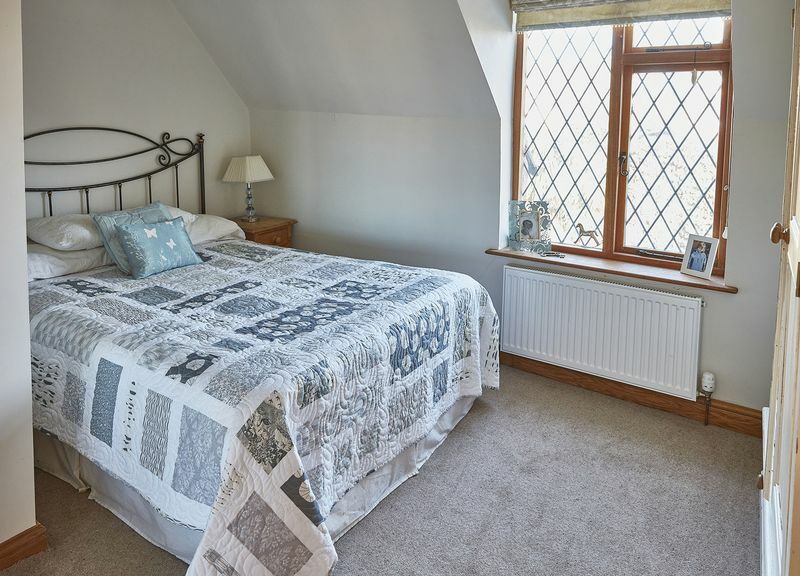 With a front aspect hardwood double glazed leaded window, radiator, feature wooden flooring, inset spot lights, built-in storage cupboard, power points. With a front aspect double glazed leaded window, radiator, feature exposed wood beamed ceiling, inset spot lights, power points. 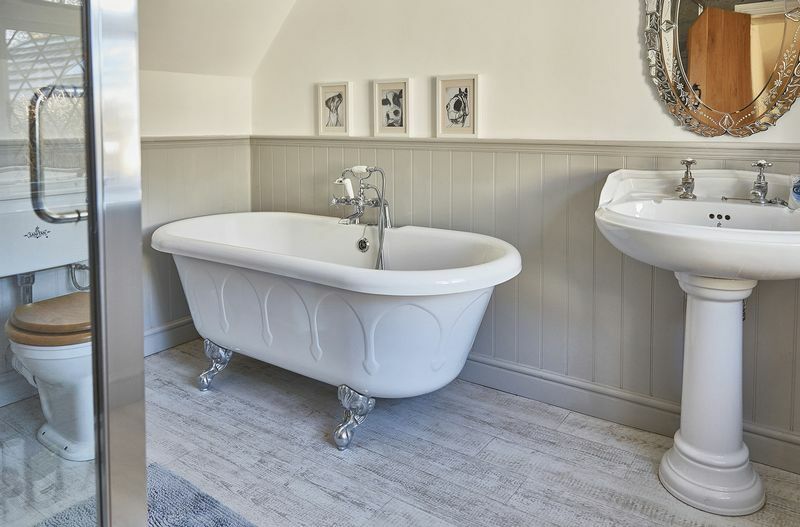 Fitted with an antique style four piece suite comprising; a larger tiled shower cubical with an inset shower with dual shower heads, a feature rolled top bath with chrome antique style mixer taps and shower attachment, pedestal wash hand basin and a low level W.c. Feature ornate chrome heated towel rail radiator. 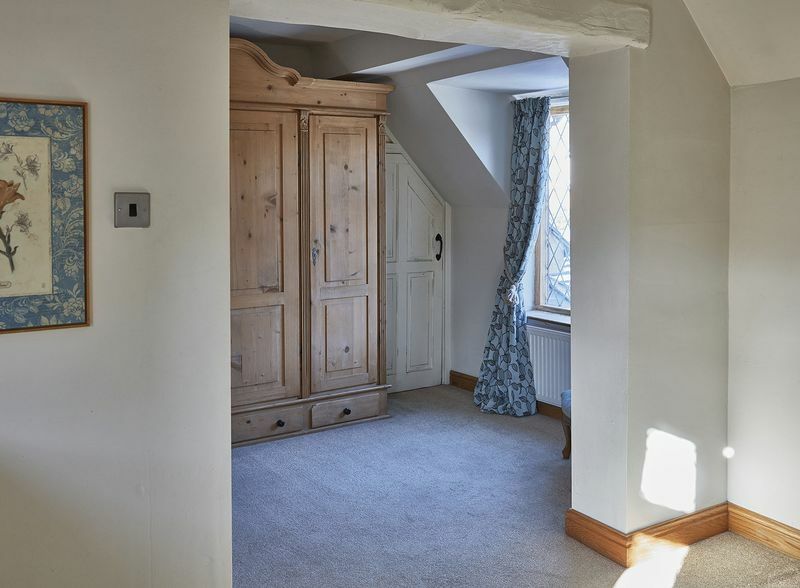 Inset spot lights, hardwood double glazed leaded window, part wood panelled walling with display shelving, loft access, wood effect flooring, built-in storage cupboard. 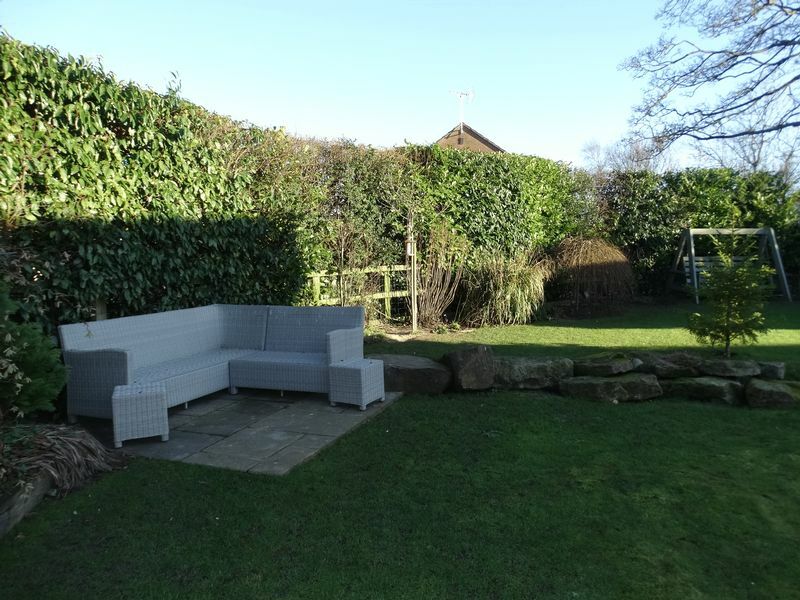 The property occupies a generous plot accessed via a private driveway which is off Leek Road. 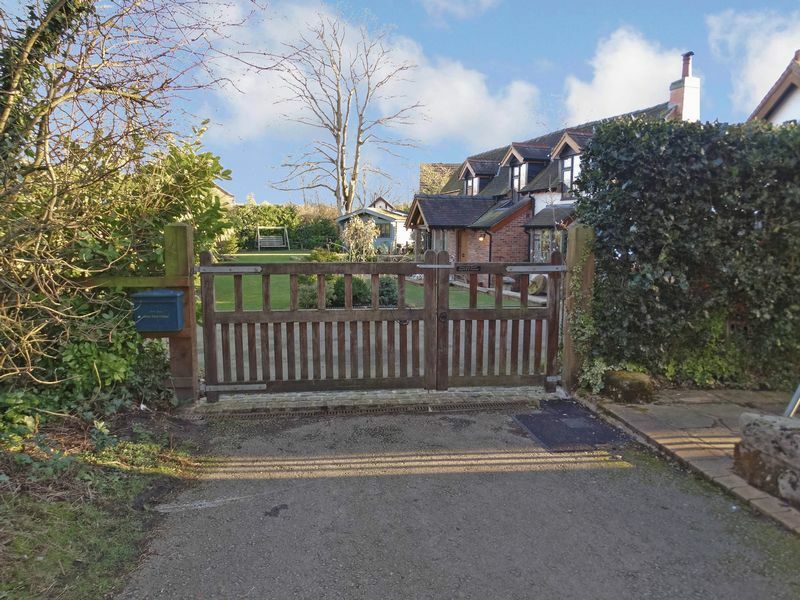 With solid wood gated access to the driveway which provides ample off the road parking for several vehicles, this leads to the detached double garage. Well maintained generous gardens which are mainly laid to lawn enjoying an array of flower bed and shrub borders with hedgerow and fence lined borders with steps leading down to stone paved walkways and outdoor seating areas, this continues from the front of the property and along to the side, with further steps to stone paved walkways and lawned garden areas which lead to the summer house. Stone paved pathways continue to the side and along to the rear with a further stone paved outdoor seating area having raised flower bed and shrub borders, a pathway continues along and opens to the rear with a further stone paved seating area, raised flower bed and shrub borders with fenced borders, this then opens out to a raised stone paved outdoor seating area with gated access to the front and to the garage. Fully fitted with power and lighting, double glazed roof window light, front and side aspect windows, and wooden French doors. With and electric remote control "Up and Over" door, power points and lighting, steps giving access to the Loft/playroom, and a garden shed attached. A timber shed attached to the garage having power and lighting.